Travel with Kevin and Ruth! : Would you go to Cuba? Or how about North Korea? Or Iran? There has been a lot of discussion lately on some travel blogs regarding this topic since popular blogger Wandering Earl recently returned from a visit to North Korea and has been posting about his experiences there. We took our kids and did a one week all inclusive family trip back in April of 2002. At the time, I'm pretty sure we were just thinking of a week on the beach and in the sun, since it's very cheap for Canadians to go to Cuba. But once we got there, and spent a day in Havana, we became curious about the history. 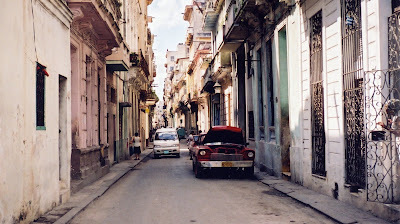 A side street in Havana. I won't get into the political crap that lead to the U.S. embargo on Cuba because that's all it is. Political crap. But if you're interested in hearing the Cuban side of the story (and there is always two sides!) you should do some research. Did you know that the vast majority of Cuban people love Fidel Castro? He's their hero, because for the average Cuban, life before Castro was much worse than life after Castro. As with Iran, you have to have a guide in North Korea. So it's a little more expensive than most other countries. You can do a guided group tour, or hire a private guide. So, now that you know that you can actually visit these countries, the original question is...would you? Would you visit a country whose politics or customs or religion you disagree with? We would do it in a heartbeat. No questions asked, when do we go. We love experiencing different cultures even if we disagree with the politics of that country. Seriously, who are we to tell them that they're wrong? Just as many people in those countries may well believe that they are totally right. Hmm. Politics and religion. But some people have so called ethical reasons for not wanting to visit some countries. As if their couple of thousand dollars spent there is going to make any difference at all to the people in power. Will we ever make it to any of these strange countries? Who knows, but if the opportunity ever arises, we'll jump on it. As for Cuba, we will definitely return there someday and spend some time exploring the countryside and getting to know the people. Now that our Spanish is better, I'm certain it would be a great trip. Maybe next year...? I'm with you. I visit other countries mainly to learn about their history and culture; in doing so I expect to find beliefs and customs different than my own. Certainly, from time to time, I find 'foreign' cultures and customs superior to those os the US. Also, the hype put out by the US State Department and Border Control are very affected by the threat of lawsuits. Since the US has become so addicted to filing lawsuits, the 'warnings' for products, services, medical attention, etc. have become such a pain to wade through and make a decision. As for safety, I tend to use the same precautions no matter where I am. Remember .... "On the south side of Chicago, it's the meanest part of town. If you go down there, you'd better just beware of a man named Leroy Brown!!!" We are with you Mary-Pat! We really have only the media to go by with some of these countries and we all know that the media doesn't always paint the true picture. The only way is to see for yourself. As long as you go prepared, know the laws and the customs and follow them you shouldn't have a problem. Get to know the country and it's people and then you have a better understanding. It's all a learning process and again you may come away still not agreeing with their culture by at least then you are more informed. Yeah, I see what you're saying. However, using that logic you may well be safer in Iran or North Korea, (Syria would probably not make a good travel destination right now!) than you are in the United States itself since I can't find any reports of a typical American tourist ever being unsafe in those countries. I would visit some countries, probably not Syria right now or any other country that had serious unrest. But I think it would be interesting to visit places that aren't on many people's radar like North Korea or Cuba. It's a great experience to see how other people live. Greece was great for that, learned alot and appreciated home when we got back! That to us is what traveling is all about. Learning about different cultures. Life in these countries is not necessarily bad for the people. History has shown us that the lives of some countries has actually improved for the people over what it had been with previous government. That's not to say their life is great but again in order to understand this you need to go there and talk first hand with the people. Again you may come away still not agreeing with it but you then have a better understanding. I travelled from Istanbul to Cairo about 15 years ago and Syria was amazing! I loved the country and the people. It makes me so sad to see what is happening there now, especially to the children. The President at the time was the current President's father and he was regarded as a god almost, along with his 2 sons, one of which had been killed in a helicopter crash. There were huge painted billboards of the family all over the place and no-one spoke against the president. I travelled to Cuba about 12 years ago but like you I wasn't there long enough. 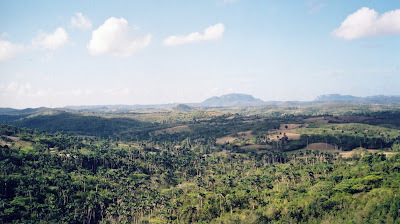 I travelled from Havana to the West coast (via Hemmingway's home) and fell in love with the country, culture, music well everything apart from the food (which at the time was understandably very limited outside of Havana and tourist resorts). In fact many places we ate in were in people's homes. I would like to return with Mr Sft and really see the whole island, and soon because things will change quickly when Fidel dies. North Korea-well I've been to China, and their human rights were pretty poor so I would consider North Korea. A BBC British journalist filmed there recently (he went disguised as a Professor with a group of students) and i watched his report which was really interesting but didn't make me want to go. South Korea would be my preference. Iran-I'd like to see some of the architecture. I think I'd probably combine a visit with other countries, maybe along the old silk route. Oh, glad you liked the Namibian reference in my blog post today. It was such an incredible place-remarkable even amongst the African Nations. We will return, and are saving hard to make it happen! We have heard that Syria is a beautiful place and perhaps one day things will settle down. It's really a shame that there is so much unrest in a number of countries because we think that there is beauty in very country and we just need to show people what is out there that they may be missing out on. Your pictures of Namibia are beautiful and they make us so much more anxious to get there and see it all for ourselves. Since we haven't even made it to Canada I really don't think we'll be heading out for anything further. For one thing the thought of that airplane ride with my restless legs just won't fly. pun intended. Our last trip to Hawaii nearly put me in a loony bin. So we'll just wander the US of A and try to see as much of it as we can. But let me tell you, I sure enjoy reading about others journeys to strange lands. There is a lot for you to see in USA and there is nothing wrong with that. International travel isn't for everyone, in fact some people don't enjoy any kind of travel and that is fine too. Everyone needs to do what they are comfortable with. We are more than happy to tell you about other countries and cultures as we see them. Yep, all those places are on our list. Actually we have been to Scotland but that was way back in 1987 and Lindsey was only a baby. We spent a week up there in a rented cottage with my cousin Helen and Tony, who we stayed with last summer in England. Hmm, don't know of any but you might find one by googling contest and the country you want to visit, you never know?! Bill & I would go anywhere... our biggest problem is figuring out just where we're going to go and when. I do hope all the embargo nonsense goes away, I'd love to visit mainland Cuba a buy up some of those gleaming, old 1950's era American cars. Funny, we still haven't quite got that Cuba/Guantanamo Bay thing figured out yet?! Mind you that's not quite the same as being in Cuba. We can't figure out why the U.S. still has an embargo with Cuba. It's not making any kind of difference, almost every other country deals with Cuba now. We also think that when they do finally lift the embargo, Cuba will never have that same quality that it does now. I suppose if we ever go back to the Caribbean, we might consider going to Cuba. We did that stint in Puerto Rico, and then went back on vacation to both Jamaica and then The Dominican Republic. We'll see if we need some "warming up" after our trip to Hawaii after Christmas. Never say never. We think that you should go Bob, you would love it there with those nice old cars. not being really up on a lot of politics, do not understand why we are still boycotting Cuba...my ex mother in law was Cuban and never heard any complaints from her about the country. I would visit if given the opportunity..North Korea...no not somewhere I would go. We can't understand why they are still boycotting Cuba either, hard feelings I guess. Anyone that we talked to when we were there were for the most part very happy with their country. There is always room for improvement but that goes for most countries. As for North Korea, maybe part of the "not somewhere I would go" is because you don't know enough about it other than what the news gives you, and what the news gives us is not always the whole story. 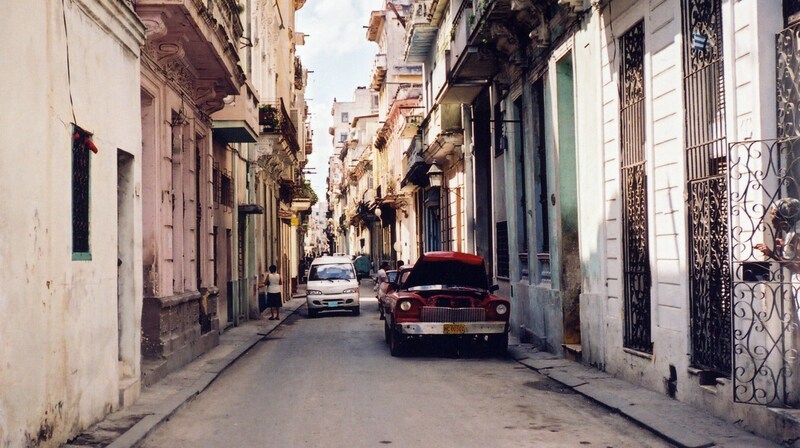 Hopefully one day you will have the chance to visit Cuba, it's a very interesting place. We agree that there are so many other choices of places to visit but three really is no place is truly considered "safe" but if we were given the chance to visit somewhere like North Korea we would certainly go. I've visited many Central/South American countries and also to the Dominican Republic and Haiti. Cuba doesn't interest me, not sure why. Afghanistan is tops on my list of places to visit but not sure when that would happen. I was offered a teaching job in Kurdistan and would love to consider it but I can't be out of Mexico that long. There are no limitations for us other than not having the desire to visit some places. The world is ours and we can go anywhere we want. Is there any place I'm not allowed to go? I can tell you as an American Uncle Sugar doesn't like to see stamps in my passport from Guatemala, Honduras, Colombia, etc. They sometimes cause problems for me. Funny that you say that Cuba doesn't interest you because both Kevin and I think that Cuba is a perfect place for you. We really think that you would love it there. I have seen some of the places in Afghanistan that you don't see on the news and it does look like a very interesting place to visit, maybe some day. Yes, until you are there and see things for yourself you just never know. We have met people who absolutely love places like Mexico and India and can't get enough of it and then there are people who have been and like you with places in the middle east that would never go again. It's a good thing that we are all different.